Revenue in the Clothing Accessories & Other Clothes segment amounts to US$99,443m in 2019. The market is expected to grow annually by 6.7% (CAGR 2019-2023). In global comparison, most revenue is generated in China (US$44,736m in 2019). In relation to total population figures, per person revenues of US$24.02 are generated in 2019. Clothing Accessories and Other Clothes include all minor clothing segments which cannot be clearly assigned to the rest of the larger categories. This includes Leather Clothes, Baby and Children's Clothes, Gloves, ties and bow ties, Hats and Caps as well as Clothing Accessories (including minor, not individually displayed segments). To ensure compatibility between market segments, when quantities were not included in historical data, quantity equivalents have been estimated. Reading Support Revenue in the Clothing Accessories & Other Clothes segment amounts to US$99,443m in 2019. Reading Support The Clothing Accessories & Other Clothes segment is expected to show a revenue growth of 7.3% in 2020. Reading Support The average revenue per person in the market for Clothing Accessories & Other Clothes amounts to US$24.02 in 2019. Reading Support In the market for Clothing Accessories & Other Clothes, volume is expected to amount to 24,629.76 m pcs. by 2023. Reading Support The market for Clothing Accessories & Other Clothes is expected to show a volume growth of 1.6% in 2020. 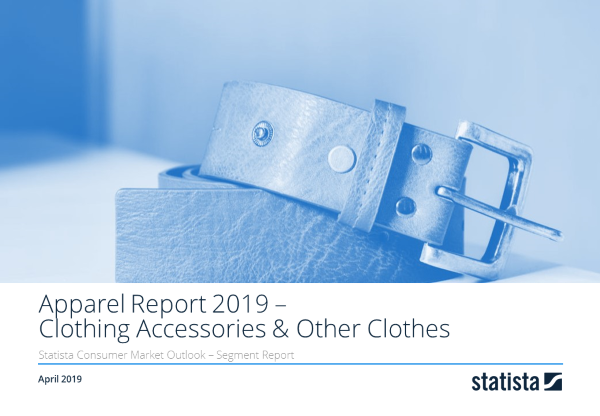 Reading Support The average volume per person in the market for Clothing Accessories & Other Clothes amounts to 5.53 pieces in 2019. Reading Support The average price per unit in the market for Clothing Accessories & Other Clothes amounts to US$4.34 in 2019. Reading Support With a market volume of US$44,736m in 2019, most revenue is generated in China. Here you can find more studies and statistics about "Clothing Accessories & Other Clothes".